Abstract: Optical waveguides comprised of nanoporous materials are uniquely suited for on-chip sensing applications, because they allow for a target chemical or analyte to directly infiltrate the optical material that comprises the core of the waveguide. 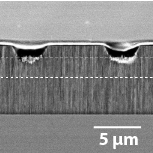 We describe here the fabrication and characterization of nanoporous waveguides, and demonstrate their usefulness in measuring small changes in refractive index when exposed to a test analyte. We use a process of electrochemical etching and laser oxidation to produce channel waveguides and integrated on-chip Mach-Zehnder structures, and we compare the responsivity and interferometric stability of the integrated sensor to that of a fiber-based interferometer. We quantify the detection capability by selectively applying isopropanol to a 200 μm length waveguide segment in one arm of the interferometer, which produces a phase shift of 9.7π. The integrated interferometer is shown to provide a more stable response in comparison to a comparable fiber-based implementation.